A few months ago, Clarke MacArthur was thinking about retiring. He didn’t know if he’d ever be cleared to play hockey again, and even if he were, he didn’t know if it would be safe. Now he’s a huge reason the Senators are moving on. 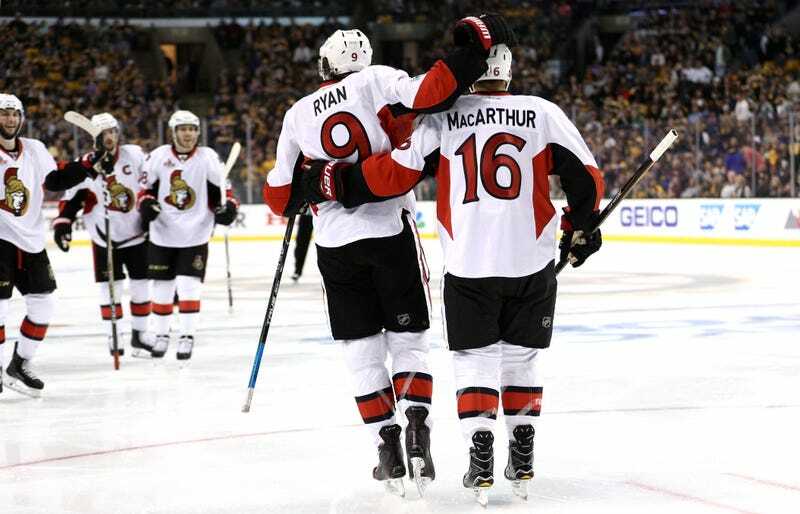 Right place, right time, and a killer centering pass from Bobby Ryan, who has been red-hot, but as MacArthur said, his biggest victory was just being able to be on the ice for a chance at a shot like that. MacArthur played in the first four games of the 2015-16 season, and the last four games of 2016-17, and in between there wasn’t a whole lot of optimism. MacArthur considered calling it a career after his latest freak injury, a concussion suffered at the hands of a teammate in a scrimmage at last summer’s Fan Fest. In January, team doctors denied his bid to return, saying he hadn’t passed his neurological tests, and recommended shutting him down for the season. But MacArthur kept working, and made a surprise return earlier this month after passing his tests, and Guy Boucher said up front that they didn’t expect a ton from the three-time 20-goal scorer. Boucher knocked down speculation that MacArthur would rejoin Bobby Ryan’s line to try to get Ryan going (Ryan has been able to flip that switch anyway) and instead put MacArthur on the fourth line. He’s had limited ice time, but he and Ryan aren’t strangers—both of MacArthur’s goals this series came on the power-play unit, and both off of setups from Ryan. MacArthur’s return is inspirational, yes—”When he raised his arms the whole city raised its arms,” Boucher said of MacArthur’s Game 2 goal—but in the playoffs there’s no room for charity. He wouldn’t be in there if the Senators didn’t think he had something to contribute, and he’s justified their faith now in a pair of big moments.